The photograph, above, is of Lucy's arrangement at our recent Sogetsu exhibition. It's hard to tell from the photo but it measures over 1.5 metres. I don't know the name of the branch material but Lucy had to use some serious mechanics to ensure it was perfectly balanced. Last month I ran a workshop for the Victorian branch on the same theme as I did for the Christchurch group. That is, my method of wiring umbrella grass stems to create surfaces. 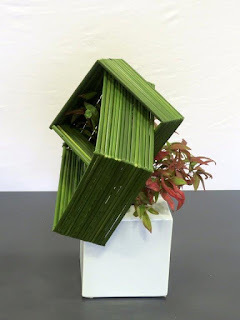 This is something I developed over the years because I have an abundance of umbrella grass and because it lends itself to creating interesting geometrical shapes. I had prepared three examples and demonstrated the wiring technique. After that, the members were left to their own creativity. I have included my arrangements here, as well as those of two of my students. For all the photos of the group please go to Sogetsu Ikebana Victorian branch. I recently had to prune back one of my loquat trees, providing the perfect opportunity for a class workshop using the branches. My two examples are below. I leave you with this photograph of my prunus mume in full bloom, which seems quite incongruous in this bleak winter weather. It's a beautiful, small tree that blooms in the middle of winter when there is very little else in the garden, apart for the trusty camellias. And its delightful fragrance is an added bonus.